"I had no idea the music would get outside the city limits of Memphis, Tennessee." What the Motown label is to Detroit, Stax is to Memphis�that is, the best that the city has to offer musically, with its apex of glory coming in the 1960s and 1970s. The musicians may be aging now, but the music is timeless, and this DVD presents live performances of some of Stax's best known artists and songs, in a series of concerts recorded in Cannes in 1990. It's rather disorienting at first, to expect the Memphis sound and to find initially shots of the waves lapping up on the beach at the Riviera. And while the French concert audience is appreciative, the musicians don't reach the heights they might have had they been playing to the home team. You sense that the performers have put these tunes through their paces more than a few times over the years, and so if these evenings aren't deeply inspired, they are solidly professional, tuneful efforts. The filmmaking is even more pedestrian, giving no particular feel for the musicians, their interactions with one another or with the audience. It's an adequate rendering, but that's about the best you can say for the camera work and editing. Booker T & the M.G.s serve as the house band after playing a couple of their own instrumentals—Phil Upchurch is on for one song, and then Carla Thomas does a long set, the highlight of which is Baby Let Me Be Good To You. She's an able performer, but she doesn't get the house rocking the way her followup act does—Eddie Floyd does a scorching rendition of Raise Your Hand, followed by an inspired version of Knock On Wood. Sam Moore is the headliner in the second set, and he's working the crowd pretty well with some old standbys, most notably I Thank You and Soul Man. Floyd and Thomas join him for the finale, a cover of Otis Redding's Sitting on the Dock of the Bay, a pretty introspective choice for what should be the climax of the concert. Promoter Bob Sidran introduces the performers in the first set, Don Kirschner style, and occasionally the songs are broken up with interviews of the musicians shot in Cannes, reflecting on their sound. They seem like a nice bunch, but they don't shed a whole lot of light on the music. Image Transfer Review: Picture quality is grainy, and the colors are garish and inconsistent; the director doesn't do his audience any favors with lots of low-angle shots of the performers, which shoot straight up into the filtered stage lights. It's not the highest quality, but the transfer of the apparently compromised original material is an adequate one. Audio Transfer Review: There's little buzzing or hissing, but you can't help but wish that the disc provided stronger dynamics and balance than what's on the mono audio track, the only one available. The concert atmosphere isn't captured particularly well, but you'll still be tempted to crank it up, and you should. Extras Review: This DVD may be instructive in the Memphis sound, but its case sure isn't a lesson in copy editing. 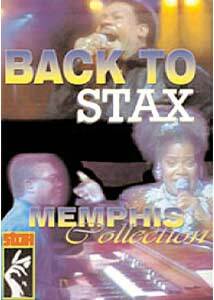 What's billed as Back to Stax: Volume 2 on the case appears on the disc before Volume 1, and while Memphis Soul is referred to as the opening feature, it can be played only separately from the main menu. Also, the copy on the back mentions the popularity of the Stax sound in the 1070s. (Man, I love that medieval rhythm and blues.) And on both the case and the menu, the tune Raise Your Hand is listed as Raise Your Head. There's a peculiar little extra, too, lines from 222 songs from the 1980s, and you're supposed to guess from whence the lyrics came. Numbers fifteen through twenty-nine are missing, for one thing; and no answers are provided. It seems like the kind of thing you'd get in a mass e-mail, and what exactly this has to do with the Memphis sound, I do not know. Also, the same content encoded for Region 2 players seems to be on the flip side of the disc. Sloppy packaging and careless video presentation keep this from being an optimal release, but it's a pretty nice runthrough of some of the best music that the Stax label had to offer. It's not a terrific concert movie, but the tunes, after all these years, still hum.